Dynamo goalkeeper Joe Willis made two massive saves in the shootout, including the match-winning save on a penalty from LAFC forward Latif Blessing in the eighth round of attempts. 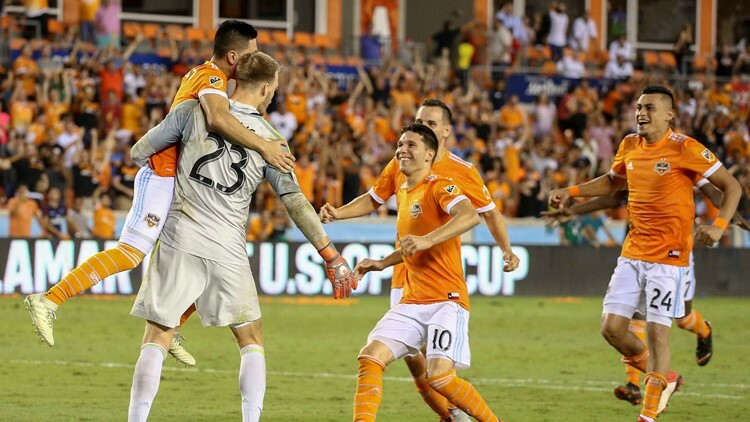 HOUSTON – The Houston Dynamo advanced to the Lamar Hunt U.S. Open Cup Final for the first time in club history after defeating Los Angeles Football Club 7-6 on penalties Wednesday night at BBVA Compass Stadium. Dynamo goalkeeper Joe Willis made two massive saves in the shootout, including the match-winning save on a penalty from LAFC forward Latif Blessing in the eighth round of attempts. Willis also kept the Dynamo alive with a save on LAFC’s fifth attempt, which could have ended the match had it gone in. With the win, the Dynamo will host the Philadelphia Union in the Final at BBVA Compass Stadium on Wednesday, Sept. 26. The kickoff time, broadcast and ticketing information will be announced in the coming days. A goal from LAFC forward Diego Rossi in the fifth minute of stoppage time sent the match into two 15-minute extra time periods. Houston had a pair of dangerous scoring opportunities in stoppage time following the second extra time period, and a wild scrum inside the LAFC penalty area in the third minute of stoppage saw several Dynamo shots blocked, ultimately sending the match to a shootout. The visitors got on the board first thanks to a counterattack in the sixth minute, when midfielder Lee Nguyen played a through ball to forward Diego Rossi to put the Uruguayan in a one-on-one with Willis at the top of the penalty area. Rossi slipped a right-footed shot past Willis to the left post to put LAFC out front. The Dynamo responded quickly to even things up in the 12th minute when defender Adam Lundkvist whipped in a corner kick from the right side to the far post, finding defender Andrew Wenger, who redirected the ball into the net with his chest. Houston took the lead on a goal by forward Mauro Manotas in the 25th minute. Forward Alberth Elis collected a pass from Wenger in the final third of the field and drew three defenders before slipping a pass to Manotas behind the LAFC back line. The young Colombian took a first-touch shot with his right foot to beat LAFC goalkeeper Tyler Miller to the far post for his fourth Open Cup goal of the year and eighth of his career. After applying consistent pressure throughout the first 30 minutes of the second half, the Dynamo found the net for a third time in the 75th minute. Midfielder Tomás Martínez played a low pass to midfielder Memo Rodriguez on the left side of the field. The Dynamo Academy alumnus, who had just entered the match three minutes earlier, calmly fired a right-footed shot to the near post and past Miller. Faced with a do-or-die situation, LAFC cut the lead in half three minutes later thanks to Rossi’s second goal of the night. Rossi received a pass from midfielder Latif Blessing and placed the ball in the bottom right hand corner past Willis. The visitors equalized in the dying moments of the game after a controversial foul decision by referee Rubiel Vasquez in the fifth minute of stoppage. Midfielder Luis Gil slid to clear a ball 35 yards from Houston’s goal, but Vasquez whistled for a foul as Los Angeles defender Jordan Harvey tumbled to the turf. The ensuing free kick sailed over everyone, but Rossi was there at the back post to clean up the trash and loft a headed shot back across goal over Willis and into the side netting. The Dynamo return to Major League Soccer action on Saturday, August 11 as they travel to Ohio to face Columbus Crew SC at MAPFRE Stadium. Kickoff is scheduled for 6:30 p.m. CDT and the match will be televised live throughout the Greater Houston area on KUBE 57.